You know when the amount on your to-do list seems unimaginable? Yet somehow you have to get it all done anyway. That was my work week- in fact it's still my work week (I'm still in the office finishing up). At some point you realize, yes there is a lot of work but if you don't take a break to do something else- anything else your head really might explode. So here it is- a quick bunny update. 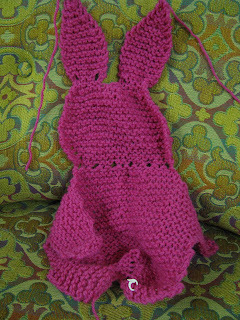 Here is Bunny number two- electric pink! (And so nice against that crazy fabric, this bunny may just have to live in my office). So far I have two feet and the back done on this one. It's amazing how last time I did this pattern they seemed to take forever and now they are just hopping off the needles (couldn't resist that-hopping, lol). Want to measure how your knitting skills have grown? Then I recommend making something from a pattern you haven't used in a while! Those bunnies sure are coming along fast!